The Rhode Island Early Learning and Development Standards (RIELDS) were developed in 2013 to provide early childhood professionals with a common understanding of the goals and expectations for what preschool children should know and be able to do as they exit preschool programs and enter kindergarten. 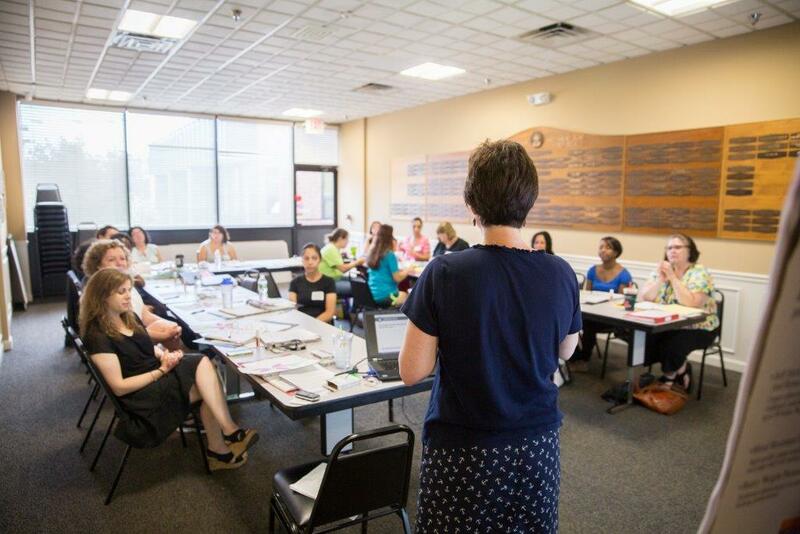 The RIELDS Project, led by the RI Department of Education (RIDE), is dedicated to providing professional development that supports administrators and classroom professionals to implement curriculum, child assessment, and family engagement systems aligned with the RIELDS at both a program and practitioner level. These courses are aligned with the state’s quality rating continuum, including DCYF regulations, BrightStars, and CECE standards. RIDE has developed a menu of professional developing offerings, developed specifically for teacher assistants, family child care providers, lead teachers, education coordinators, administrators, early intervention practitioners, and special educators. Our schedule is organized into four quarters: Fall (September – November), Winter (December – February), Spring (March– May), and Summer (June – August) with offerings available throughout the state. For questions regarding RIELDS Professional Development, please call the PD Coordinator, Elaine Remillard, at (401) 222-2118 or at Elaine.Remillard@ride.ri.gov. Participants in this hybrid (partially online and partially face-to-face) 18-hour training will develop an understanding of the RIELDS nine domains of learning; begin to develop an understanding of key components of child development, 0-5, that influence practice; and the importance of each to the growth of young children. Three sessions will be held face-to-face and three will be online using the Blackboard e-learning system. Participants will be required to go online between the face-to-face classes and complete assignments related to the nine domains of the RIELDS. Participants in this course must have reliable high-speed Internet access and access to a computer, in addition to a working level of knowledge and comfort in both. The Blackboard online system for this course is housed at Rhode Island College (RIC) and, therefore, individuals will be required to set up and use a RIC email address for the duration of the course. It is suggested that participants have prior experience with online learning, including Blackboard. Participants will be asked to use discussion boards, assignments, and other media modalities as a mode of learning in the Blackboard system. Participants should possess a willingness to access and work with the RIC help desk if needed to gain support for online access. This course is intended for individuals new to the RIELDS. It serves as a prerequisite for family child care providers, teacher assistants, teachers, administrators, and other early childhood professionals. Those holding a certificate from previous attendance at a RIELS training do not need to attend this course. Registration for this course must be done through both RIDE via Elaine Remillard at Elaine.remillard@ride.ri.gov and RIC’s Professional Studies and Continuing Education department at www.ric.edu/cess. When registering with RIC, please follow the link to Registration Information and Forms in the left margin. Select the Register for Courses link. Upon successful completion of the training, participants will receive a Certificate of Achievement from RIDE and 18 hours of RIDE professional development credits in addition to an optional CEU or college credit. When registering, please register as follows: CONT 050C-80 for the no cost professional development; CONT 250C-81 for the $40 CEU option; ELED 250 C-80 for the 1 college credit $314 option. This course requires you to have access to a computer and reliable high-speed Internet. This course is suggested for those who have prior experience with online learning. This course is delivered in Spanish. This 36-hour, 12-session course focuses on developing an understanding of the RIELDS nine domains of learning and development and how they inform care and teaching; defining reflection and using reflection regularly; and developing a working knowledge of the four components of curriculum: content, context, process, and teaching and facilitating. This training is intended to be an overview of curriculum, and to support the development of a curriculum framework. Participants will examine their classroom curriculum and align their practice to the standards. Successful completion of either a RIELS training or completion of the Foundations course is required before beginning this course. Participants choosing this course should have previous training in child development, experience working with the 0–5 population, and be prepared to complete college-level written and reading assignments. This course is equal to a 100-level college course in difficultly, thus participants should have completed a GED or have a high school diploma. Upon successful completion of this 12-session course, participants receive a Certificate of Achievement from RIDE and 36 hours of RIDE professional development credits. Participants who complete 36 hours of core training plus nine hours in the Next Steps series are eligible to receive one undergraduate credit through the University of Rhode Island. This course has the prerequisite of a previous RIELS course OR the Foundations for the RIELDS course. This course is intended to provide an overview to the RIELDS document, and how the standards are used. Participants in this 18-hour, 6-session training will develop an understanding of the RIELDS nine domains of learning; begin to develop an understanding of key components of child development, 0–5, that influence practice; recognize how families are partners in their child’s growth and development; and understand the relationship of responsive caregiving and curriculum and the importance of each to the growth of young children. This course is intended for individuals new to the RIELDS. It serves as a prerequisite for teacher assistants, teachers, administrators, and other early childhood professionals. Those holding a certificate from previous attendance at a RIELS training do not need to attend this course. Upon successful completion of the 6-session training, participants receive a Certificate of Achievement from RIDE and 18 hours of RIDE professional development credits. Participants in this hybrid (partially online and partially face-to-face) 18-hour training will develop an understanding of the RIELDS nine domains of learning; begin to develop an understanding of key components of child development, 0-5, that influence practice; and the importance of each to the growth of young children. Three sessions will be held face-to-face and three will be online using the Blackboard e-learning system. Participants will be required to go online and complete assignments related to the 9 domains of RIELDS in between the face-to-face classes. Participants in this course must have reliable high-speed Internet access, access to a computer, in addition to a working level of knowledge and comfort in both. The Blackboard online system for this course is housed at Rhode Island College (RIC) and, therefore, individuals will be required to set up and use a RIC email address for the duration of the course. It is suggested that participants have prior experience with online learning, including Blackboard. Participants will be asked to use discussion boards, assignments and other media modalities as a mode of learning in the blackboards system. Participants should possess willingness to access and work with the RIC help desk if needed to gain support for online access. Upon successful completion of the training, participants receive a certificate of achievement from RIDE and 18 hours of RIDE professional development credits in additional to an optional CEU or college credit. When registering, please register as follows: CONT 050C-80 for the no cost professional development; CONT 250C-81 for the $40 CEU option; ELED 250 C-80 for the 1 college credit $314 option. This course requires you to have access to a computer and reliable high-speed Internet access. This course is suggested for those who have prior experience with online learning. This 36-hour, 12-session course focuses on developing an understanding of the RIELDS nine domains of learning and development and how they inform care and teaching; defining reflection and using reflection regularly; and developing a working knowledge of the four components of curriculum: content, context, process, and teaching and facilitating. This training is intended to be an overview of curriculum, and to support the development of a curriculum framework. Participants will examine their classroom curriculum and align their practice to the standards. This 36-hour, 12-session course focuses on developing and implementing a high-quality classroom which includes: an understanding of the RIELDS nine domains of learning and development for children birth through age 5; recognizing the connection between responsive care and education for infants and toddlers; reflecting on teaching practices; understanding the connection between a quality standards-based classroom and the RIELDS; creating meaningful opportunities for community and family engagement; expanding knowledge of the four components of curriculum; and understanding authentic assessment and using assessment information in curriculum planning. Upon completion of this training, participants will have developed a broad understanding of the key components of a high-quality classroom. Successful completion of either a RIELS training or the Foundations course is required before beginning this course. Participants in this course should have a strong early childhood background with knowledge and experience in the areas of curriculum and assessment. Participants should also currently be working in a classroom, since activities used throughout the course relate to day-to-day teaching. Individuals should have an early childhood educational background that includes a minimum of 12 higher education credits in Early Childhood Education. This course is equal in difficulty to a 400-level college class. Participants who successfully complete the 36 hours of training receive a Certificate of Achievement through RIDE and 36 hours of RIDE professional development credits. Participants who complete 36 hours of core training plus nine hours in the Next Steps series are eligible to receive three undergraduate credits through the University of Rhode Island. This course has the prerequisite of a previous RIELS certificate OR a Foundations for the RIELDS certificate. This 36-hour, 12-session course for education coordinators and other early childhood administrators focuses on understanding the RIELDS nine domains of learning and development and how to use this information in implementing a standards-based program. Topics covered include recognizing the connection between responsive care, early care and education, and the RIELDS; reviewing the content presented in the curriculum and the classroom course staff will have attended; recognizing and connecting Rhode Island’s Quality Rating and Improvement System (QRIS)—including RIDE approval and BrightStars—and strategies for staff support in implementing the RIELDS. Work will include developing a personal and program improvement plan, with an emphasis on strategic planning. Successful completion of either a RIELS training or completion of the Foundations course is required before beginning this course. Participants in this course should have a strong early childhood background that includes a minimum of an associate’s degree. This course is equal in difficulty to a 400-level college class. This course includes 12, 3-hour sessions. Participants who successfully complete the 36 hours of training receive a Certificate of Achievement through RIDE and 36 hours of RIDE professional development credits. Participants who complete 36 hours of core training plus nine hours in the Next Steps series are eligible to receive three undergraduate/graduate credits at the 400 level through the University of Rhode Island. This 39-hour, 13-session course is an expedited pathway for educators with Rhode Island State Teaching Certification to meet the requirement for the “Foundations for the RI Early Learning and Development Standards” course AND the “Implementing a Standards-Based Classroom” course. Participants will develop an understanding of the RIELDS nine domains of learning; begin to develop an understanding of key components of child development, 0-5 that influence practice; and develop an understanding of the importance of each to the growth of young children. They will use this knowledge to focus on developing and implementing a high-quality classroom which includes: recognizing the connection between responsive care and education for infants and toddlers; reflecting on teaching practices; understanding the connection between a quality standards-based classroom and the RIELDS; creating meaningful opportunities for community and family engagement; expanding knowledge of the four components of curriculum; and understanding authentic assessment and using assessment information in curriculum planning. Upon completion of this training, participants will have developed a broad understanding of the key components of a high-quality classroom. Participants should also currently be working in a classroom, since activities used throughout the course relate to day-to-day teaching. Participants who complete this training plus six hours in the Next Steps series are eligible to receive three undergraduate credits through the University of Rhode Island. Participants in this course are required to hold a RI Teaching Certificate.